Home of the famous Jerilderie Letter, dictated to Joe Byrne by Ned Kelly. The township of Jerilderie was established in 1859. It is nestled on the banks of Australia’s longest creek, the Billabong Creek, and is located on the Newell Highway, the main inland route linking Melbourne and Brisbane. Jerilderie, meaning “with reeds” or “reedy place” is also the commencement of the Kidman Way. Jerilderie is the only town in NSW featured in the Ned Kelly saga, and has more surviving authentic Kelly sites than anywhere else along the Ned Kelly Touring Route. At sundown on Saturday, 8 February 1879 the Kelly gang arrived at the Woolshed Inn (3 km east of Jerilderie) to pass some time before they rode into Jerilderie, surrounded the police barracks and locked up the two policemen in their own cell. On Sunday morning, Ned and his gang dressed themselves in police uniforms and masqueraded as reinforcements sent to strengthen police patrols on the border! Dan Kelly accompanied Mrs Devine, the police constable’s wife to prepare the Courthouse for the usual monthly Catholic Church service, delivered by a visiting priest. Early on Monday morning, Dan Kelly and Joe Byrne rode to the blacksmith shop of Samuel Rea where they had their horses re-shod, at the expense of the New South Wales Police. Ned and Joe bailed up the bank teller and the junior teller and confiscated £691 from the cash till. After locating the bank manager, £1450 was taken from the safe. The bank employees were escorted to the hotel’s back parlour and held hostage. Ned recruited the hotel groomsman to burn various documents held by the bank as collateral for loans, a deed which he carried out with alacrity. Next the Kelly gang went to the Post and Telegraph office to order the telegraph lines to be cut down. Ned, in company with Trooper Richards and Bank Teller Edward Living, then went in search of Samuel Gill, the Editor of the Jerilderie and Urana Gazette, to fulfil the true purpose of the gang’s visit to Jerilderie – to print Ned’s side of the story that led he and his gang along the path of outlawry – the now famous ‘Jerilderie Letter’. Unable to find Gill, Ned gave the manuscript to Living to pass on to Gill for printing and circulation. On handing over the manuscript, Ned said to Mr Living “Mind that you keep your promise and see that they are printed, or you will have to reckon with me next time we meet.” However, Mr Living did not give the manuscript to Gill, rather he kept it himself, and it was not to resurface until more than 100 years later. Today the original Jerilderie Letter is held at the State Library of Victoria. Living kept the ‘Jerilderie Letter’ and it only surfaced more than 100 years later, when it was donated to the State Library of Victoria. Jerilderie is 328 kilometres from Melbourne and 660 kilometres from Sydney. 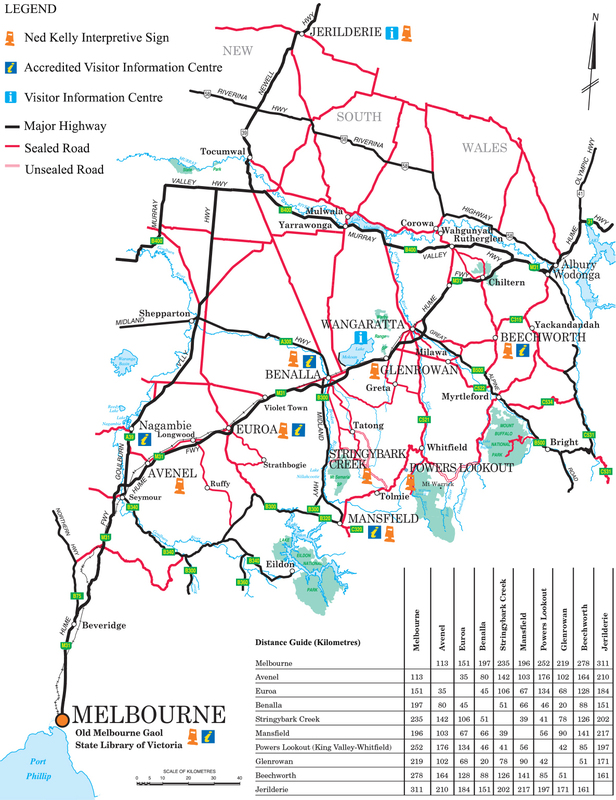 From Wangaratta, it is a distance of 157 kilometres via the Murray Valley and Riverina Highways. By train, the nearest station is either Albury or Wagga Wagga. A coach from Wagga Wagga to Jerilderie provides transport on Monday, Wednesday, Friday and Sunday.